﻿Our DR PRO 2900 blows away common washers with superior power and easy-to-use features! The DR PowerGun makes selecting the right pressure quick, intuitive, and safe. And for a limited time, we are including 2 FREE Cleaning Tools: the Turbo Blaster and the Soap Blaster! Born to Clean. Built to Last. A BETTER & FASTER Pressure Washer! Forget the frustration of working with those underpowered, box store washers! The DR PRO 2900 delivers the raw cleaning power you need to tackle the toughest cleaning jobs. We start with a high-quality DR OHV engine and an aluminum axial cam pump—the heart of a pressure washer that provides up to 2900 PSI and a robust flow of 2.4 GPM. A common frustration with pressure washing is that you constantly need to stop and switch nozzles. Our Power Gun puts the ability to change settings, quickly and easily, right at your fingertips. Now with Two FREE Attachments! Our high-pressure flex hose is soft, pliable, and easy to wrap. No more wrestling with hard, pinching hoses that are almost impossible to coil. Urethane coating is non-marring (so it doesn't leave black marks on the very thing you are trying to clean). Each of the 4 pressure selection settings is marked with an intuitive pictogram: CAR, for autos and other light cleaning jobs; WOOD, for siding and other surfaces that require intermediate pressure; SIDEWALK, for pavements and other surfaces that can withstand full pressure; and SOAP, for applying detergent. Our OHV engine is easy-starting and provides plenty of power to drive the pump at full capacity. The horizontal shaft design is ideal for pressure washers because it positions the pump for easy access to connections (instead of placing them very close to the ground as vertical shaft engines do). 50 state CARB approved. 4 included nozzle tips (0°, 25°, 40°, Soap) cover every use, from a concentrated beam to deliver maximum PSI and cleaning power (0°), to a wide gentle setting for broadcasting and agitating detergent. fantastic, easy to use, easy to store. Used on deck, siding, and gutters. could not be more pleased. Love the turbo tip and the floor attachment. Cleans patio stones quick. This is a great unit! It's up for any task around your home. The included turbo nozzle quickly cleans stained concrete. A.Thank you for your question. 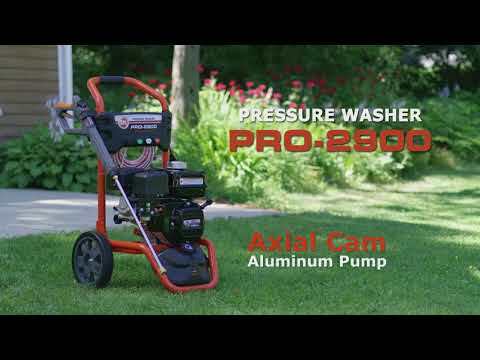 The DR Pro-2900 Pressure Washer has 4 included nozzle tips (0°, 25°, 40°, Soap) cover every use, from a concentrated beam to deliver maximum PSI and cleaning power (0°), to a wide gentle setting for broadcasting and agitating detergent. It also includes the Soap Blaster and Turbo Nozzle for free. Please feel free to contact us if you have any other questions. Q.How does the detergent injection work? Do you have to put a separate tube into the tank, or is there one connected to the pump all the time? A.Thank you for your interest in the DR Pro-2900 Pressure Washer. The Pressure Washer is shipped with a siphoning tube and cap. You will need to insert the siphoning tube through the hole in the cap, insert the siphoning tube into the detergent and snap the cap onto the detergent tank. Please let us know if you have other questions. Q.Can a concrete cleaning solution be used in the onboard detergent tank? A.Thank you for your question. There should be no problem with using a concrete cleaning solution in the onboard detergent tank as long as it is not corrosive enough to eat through the plastic and hoes. Please check the manufacturer's label for the cleaning solution to ensure it is safe for use. Feel free to give us a call if you have any other questions. Q.I understand that the garden feed hose should be no longer than 50 feet. What is the best diameter for the garden feed hose in order to supply enough water to the pump? A.Thank you for contacting us. A standard width garden hose will work great with the DR Pro-2900 Pressure Washer. The important thing is that you don't exceed the 50' length limit. You run the risk of depriving the pump of water and causing damage. Please feel free to contact us again if you have any other questions.